So here it is, the sequel to the critically acclaimed and critically drooled over, Mass Effect: I could write for a while on this game…So I’m going to. Without wishing to give away too much, you are once again thrust into Commander Shepard’s space boots and are now working for the morally questionable Cerberus, on account of the fact they kindly resurrected you; And indeed Shepard gets berated for this a quite a few times, presumably its worth it for the health insurance. The widely appreciated BioWare appear to have taken and processed any criticism of the original game and spat out something truly epic. The structure of the narrative is fairly simple, but vastly effective and sees Shepard preparing for a suicide mission to save humanity, for which he or she must gather a formidable crew for. And in order for the team to be in fighting shape, you must lend them a hand with their own problems. So the bulk of the game is spent recruiting and aiding your companions. While this might seem formulaic on the surface, the individual stories constitute some of the best storytelling, bringing the player very close to some delicate and emotional situations. Now it was expected that the graphics would be updated in the second instalment of the series, but what has been produced is truly stunning, especially for the 360. This time round all the colours are more defined and radiant, widening the range of the spectrum. There’s a significant increase in general clarity and resolution, and the frame rate has been reduced to 30 to prevent the issues with visuals appearing somewhat choppy in Mass Effect 1; the lack of a 60 fps capability is really not an issue. BioWare have thankfully gotten rid of the grainy-VHS look, and have clearly spent a lot of time improving everything from character models to the environments. However you look it, the graphics are a ruddy fantastic sight to behold, many are even calling it the current graphics top-dog. Combat has been dramatically altered and overhauled, and has consequently improved. Most notably, the awkward snap-into-cover system of the original has been ditched for a much smoother operation controlled by the A button which must now, have already prevented countless smashed controllers. Additionally the Medi-gel system has been revised, making their primary use reviving, along with the “unity” power which allows for a quicker and more centralised healing of your squad. Besides the larger changes there are a number of tweaks and additions including more weapon types and powers which are certainly welcome, including what appears to be a portable nuclear weapon, I can’t argue with that. Using the target reticule in Mass Effect 2 feels a lot more reliable; you are able to trust that it’s doing its job, rather than a spreadsheet (sorry Eve Online fanboys) underneath the gameplay calculating stats. Combat is now more streamlined, and it’s satisfying to see that strategy still pays off. The addition of some, frankly awesome, heavy weapons only add to consideration of tactics, as you’ll have to know when and when not to use them, as they can turn out to be life-savers in particularly sticky situations. In general fighting seems more fluid and fast-paced, and this complements the game’s cover-shooter/RPG oddity well, making it not only an exciting experience, but a unique one. 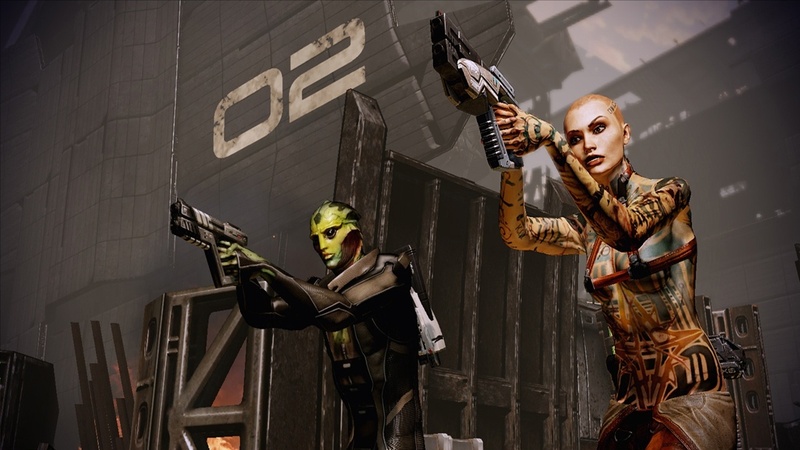 Mass Effect 2 and indeed the Mass Effect series, isn’t your traditional RPG; so one thing I missed at first, was its lack of economy, diversity in objects, weapons and armour. There’s usually about two guns per weapon type, and a fairly limited selection of armour; As I progressed I then found that the player can really only buy the upgrades, which you can discover by exploring, aside from a few novelty items for decoration and some slightly altered N7 armor peices. This frustrated me a little to begin with, but I quickly realised that to approach the game in this way is simply incorrect. BioWare have proved through games like Dragon Age: Origins that they can do the whole economy deal, with items galore and layers upon layer of complexities and indeed deep skill trees, but they have pursued a different path with the Mass Effect trilogy. 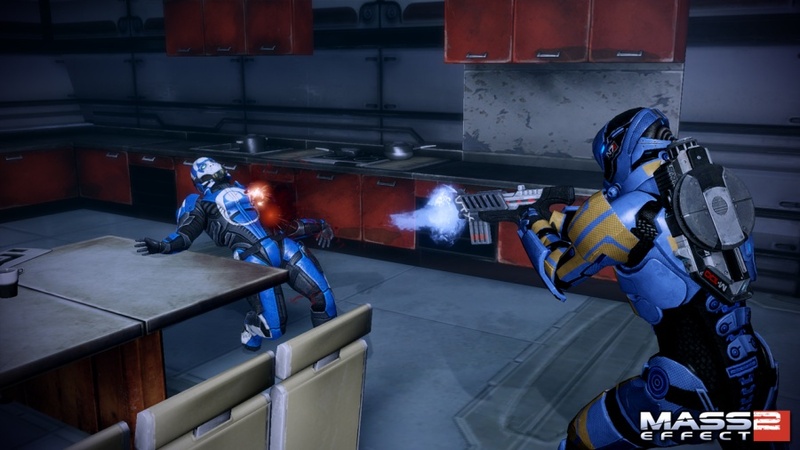 Clunky elements like the inventory system from Mass Effect 1 have been removed to better fit the style of the series which focuses on story, presentation, combat and interaction. The voice acting, character animation and lip syncing, is once again outstanding. Both the writing and performances are executed with perfection – the true drama and epicness (that’s a word right? meh) of this space opera is conveyed brilliantly, and I may or may not have given the game a standing ovation on completion, on my own in an empty room….Yet still BioWare have managed to retain many light-hearted and often hilarious little encounters, whether its a bloodthirsty Krogan making a terrible pun or overhearing a classic friend-who-wants-to-get-with-girl conversation, as he desperately tries to drop hints while it all goes swiftly over her head. The dialogue itself is on the whole, very well written, and we can forgive one or two cliched insults (usually from Subject Zero, with whom I had a very rocky relationship with on account of this problem). 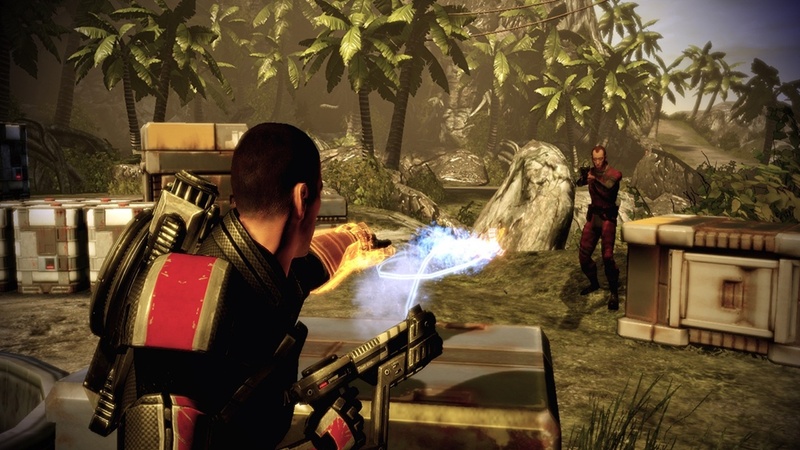 BioWare have also introduced an entertaining new feature called the Interrupt System, which allows the player at specific points in conversation to take direct action, whether it be of Renegade or Paragon persuasion: this feature works well with the intuitive dialogue system, granting the player yet further control of their Shepard. The cast has its fair share of stars, for example Martin Sheen (Apocalypse Now, West Wing), but they were not chosen simply because they were famous, and in an industry increasingly infiltrated by brainless Hollywood stars looking to get their names in, this is exceptional. Seth Green and Yvonne Strahovski most notably give cheekily-lovable and endearing performances respectively (the body and face based off of her doesn’t go amiss either) and further bring the galaxy to life. Squad members are varied and memorable...and sometimes irritating head-cases. For those who enjoyed some of the sleazier aspects of the galaxy in the original, do not fear, for there’s no shortage of aliens smuggling raisins and dancing how your mother told you not to, and for the more romantically inclined, BioWare present a lovely bunch for you to share your (possibly final) moments with, although those of you hoping for something more than a bra flash, you will be thoroughly dissapointed. One aspect of the writing which particularly impressed me was the reference to real world issues, which one can relate to whether its problems with the galactic economy or racism – At one point I stumbled upon a rather amusing bachelor party thrown by a human on behalf of an Salarian friend who was desperately trying to comprehend the attraction of watching the exotic dancer. It’s these sort of details and facets which make Mass Effect 2 especially immersive. The most noteworthy improvement on the original are the side quests and diversity of them: Unlike the original where all the criminal organisations coincidentally chose to use the same architect and same building on every planet, Mass Effect 2 offers a number of vastly different planets, from deep jungles, to icy cliff edges and a large range of architecture; Aside from an inexplicable, yet necessary abundance of crates everywhere (which leads me to think of people in the future as quite the messy little chaps), the environments are masterfully created, and a new interesting experience, working brilliantly with the breath-taking graphics. To bolster this new found variation, BioWare have introduced a number of methods, in many different situations, to keep combat and exploration interesting, whether it be basic puzzles, crates on a conveyor belt (causing need to time shots) time limits, staying out of harmful solar radiation or fighting your way through fog. You can safely say that this game rarely gets boring (my playtime and the period that playtime occurs within attests to this – unfortunately for my social life). Combat feels more seemless and enjoyable. The mission structure is, much like Mass Effect 1, very agreeable, and I can’t relate how much I like being logically taken back to my ship/central area after a mission instead of trudging back and forth through areas I’ve already cleared. Which reminds me – the ship is much larger now, and pretty bloody awesome – any game I’m able to have my own cabin in, along with a space hamster, gets my vote. Each part of the ship serves a purpose and there a small side quests and memorable characters, which makes returning to the safety of your ship, something you’ll often look forward to. One slightly controversial element of gameplay is the scanning for resources: while I understand the need for a more down-tempo feature to acquire the base resources and to offset the accelerated action, its perhaps just a little too slow, even with the upgrade to quicken it – although I admit, the descriptions of the planets do make it much more intriguing visiting each one. Equally, having fuel limit may seem a little unnecessary, but it does help to make you feel like you are making important, meaningful decisions, which a captain would have to make – it’s just another little quirk to keep gameplay fresh, and make exploration to the farthest reaches of the galaxy feel all the more intrepid. Another small gripe: I chose the engineer specialisation for something a little different, on the promise I would command combat drones, and turns out these drones are in fact holographic balls, literally, but they didn’t prove as ineffectual as I perceived, although I was more thinking along the lines of some sort of robot with an unnecessarily large gun. Loading times are still fairly long, but gone are the long awkward lift rides, so you’ll no longer have to wonder who passed air, but a short wait is a small price to pay for what it’s loading. Also credits seem a little redundant – you end up with a bulging bank account yet you don’t even really need to purchase many upgrades for the upgrade system (a part I do commend) as you’ll discover them on your travels. Nevertheless, these are small problems. Mass Effect 2 is, if nothing else, an outstanding achievement, and is undoubtedly another reason why the games industry is now more regularly serving as host to more high profile releases on the level of blockbuster movies, as this game offers an experience far and above some recent Hollywood twoddle. The average player will rack up around 30 hours on one playthrough, that warrants the price as it stands, let alone remarkable cinematic direction, intelligent themes, exciting gameplay and a vast wealth of lore – As I neared the ending of the game, I checked my codex, and due to my OCD tendencies, felt the need to click every entry to remove the “new” notification; I soon realised how many 2 or 3 paragraphed and narrated entries there were and how much dedication and effort has been put into this universe. The criticisms I would mention like squad mates being a bit too enthusiastic in battle and both repeating the same phrases over and over, or mistakenly taking cover behind some good solid air, are really so minute that they barely detract from the experience. The real brilliance is the way one is left longing for the already planned sequel, after the ending which can be oh so different depending on your choices, knowing that your actions now will affect the awesome story that will ensue, as those who were lucky enough to have been able to import a character into this game will know. This game is a must-(stop-reading-my-blog-if-you-don’t)buy. As cliched as it sounds, it’s a emotional journey that will leave you with real connections to certain characters, and will allow you to act accordingly to those feelings, and although it’s mighty early on, I’m predicting this as game of the year. Play this.